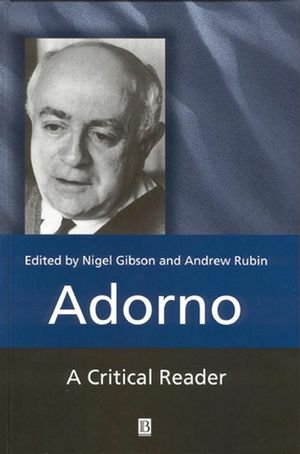 Adorno: A Critical Reader presents a collection of new essays by many of the world's top critics that examine Adorno's lasting impact on the arts, politics, history, philosophy, psychoanalysis, and sociology. Nigel Gibson is Visiting Assistant Professor at the Institute of Liberal Arts and Interdisciplinary Studies at Emerson College in Boston, where he teaches philosophy and postcolonial studies. He is also a research associate at Harvard University and at Brown University. He is editor of Rethinking Fanon (1999) and co-editor, with George C. Bond, of Contested Terrain and Contested Categories: Africa in Focus (2001). Andrew Rubin is currently a doctoral candidate in the Department of English and Comparative Literature at Columbia University. He is editor of The Edward Said Reader (2000), and has written articles for a variety of national magazines and newspapers, including The Nation. Introduction: Adorno and the Autonomous Intellectual: Nigel Gibson and Andrew Rubin (both Columbia University). Part I: Politics and Culture:. 1. Adorno in Reverse: From Hollywood to Richard Wagner: Andreas Huyssen (Columbia University). 2. Mass Culture as Hieroglyphic Writing: Adorno, Derrida, Kracauer: Miriam Hansen (University of Chicago). 3. Theodor W. Adorno and the Dialectics of Mass Culture: Douglas Kellner (University of California, Los Angeles). 4. Adorno's Politics: Russell Berman (Stanford University). 5. "Why were the Jews Sacrificed? ": The Place of Antisemitism in Adorno and Horkheimer's Dialectic of Enlightenment: Anson Rabinbach (Princeton University). 6. Demythologizing the Authoritarian Personality: Reconnoitering Adorno's Retreat from Marx: Lou Turner (North Central College, Illinois). 7. The Adorno Files: Andrew Rubin (Columbia University). 8. Adorno as Lateness Itself: Edward W. Said (Columbia University). 9. Immanent Critique, or Musical Stocktaking? Adorno and the Problem of Musical Analysis: Max Paddison (University of Durham). 10. Adorno and the New Musicology: Rose Rosengard Subotnik (Brown University). Part III: Critical Theory and After:. 11. Rethinking an Old Saw: Dialectical Negativity, Utopia, and Negative Dialectic in Adorno's Hegelian Marxism: Nigel Gibson (Columbia University). 12. Hegel on Trial: Adorno's Critique of Philosophical Systems: Mauro Bozzetti (University of Urbino, Italy). 13. The Dialectic of Theory and Praxis: On Late Adorno: Henry W. Pickford. 14. Radical Art: Reflections after Adorno and Heidegger: Krzysztof Ziarek (University of Notre Dame). 15. Queerly Amiss: Sexuality and the Logic of Adorno's Dialectics: Jennifer Rycenga (San José State University). 16. "As though the end of the world had come and gone" or Allemal ist nicht immergleich – Critical Theory and the Task of Reading: Samuel Weber (University of California, Los Angeles). Contains a groundbreaking essay and introduction that reconsiders Adorno's role as an intellectual in light of recent evidence, disclosed here for the first time, that funding for the Frankfurt School was tied to the Central Intelligence Agency. New essays re-evaluate Adorno's work in the context of the many fields that his writings have shaped irreversibly. Captures the interest of those who study the arts, politics, history, philosophy, psychoanalysis, and sociology.